same question as my previous one: i put in the CSS command but nothing happens. In you post you write: "see screen shot below and noticed background color has been changed to green", but I don't see any green there background. Sorry wrong screenshot. It has been corrected. No other error except for that screenshot. Remains the question why it doesn't work in my blog. Nothing turns green there after putting in your CSS command. Could be your template and the way post title are defined in the CSS. same problem like rayplay here. Then perhaps we will have to get into EDIT HTML and do the editing there. Try it again and tell me the results. unfortunately nothing happens when i delete those spaces. I checked RayPlay's blog and saw that his post title background color is green. Perhaps you can check with him if he has solved the problem and if so, how. i don't see a green post title background on his site!? Look at Plaatje en praatje. Unfortunately Blogger have not enabled images for screen shots in comments. without the pound (#) symbol. Add pound symbol prefix only when using Hex color code, for example #00ff00 (green). Thanks for the heads up. I must have missed as I didn't save and preview somehow yielded the background color so thought everything OK.
i visited that site but still didn't see any green background color, only green text color!? i also pasted this new code but still nothing happens. Did you follow that? Also what browser are you using? yes i did that but nothing happened. i am using the current firefox browser. plus i would like to have gray color instead of green if possible (#696969). For Lifted Loud: What template are you using? or instead of arial, you can use other font like Times of Courier etc. I have migrated to the new templates and lost the title centering to my posts. Could you advise how to centre both the titles of my posts and right hand columns. Looks like you solved your problem? Viewed with Google Chrome, your post titles are all centered. BUt it the process of adding some html to the body, I also centred not only the headings but also the content of the RH column. so i take it you can't help me out here!? thanks tho. background-color:white;} however it didn't have any impact on the comment background. You can see what I am talking about here: http://bit.ly/cwTl6e I would like to change the comment background to white or any other color to make it a bit more visible. I managed to change the post-title-background-color with no problems at all... Great tip ! When you write this line, click below the line and wait until a second. Hey , thanks for this Tutorial. 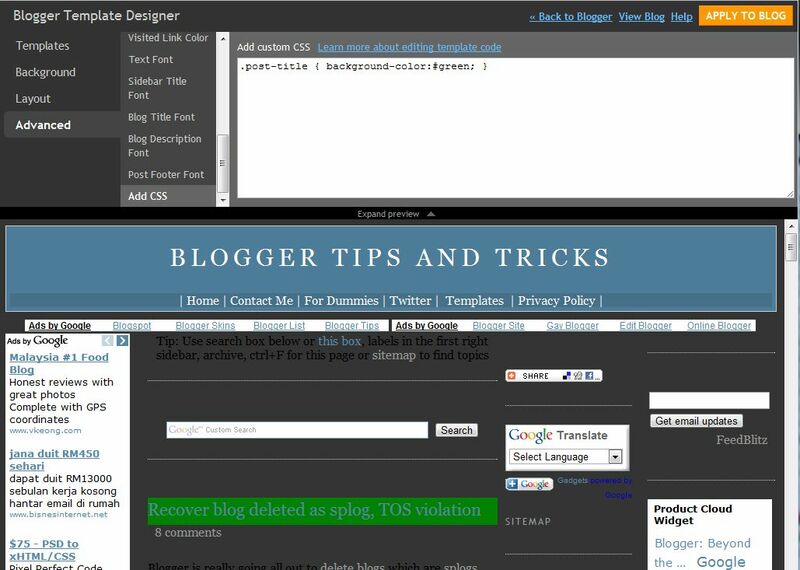 I have a slightly different query, I had inserted a dotted separating line under all my H1 tags thru css (basically my purpose was for the Post titles) but as the Blog title also falls under the H1 title the line is showing there as well in header... could you suggest a solution, thanks a lot in advance. scoionerd, look for .post for example, look at HOw to center post title but adapt to what you want to do. but instead of color..how about to add image for background? Hi Pink Diva, see Test background image for post title. Test successful so if you still understand how it was done, ask again. Hello, I was wondering what the code is to make a sidebar title background? Like I want there to be an image behind the sidebar titles. I know how to do it for the Old Blogger but not for Blogger In Draft. Please help! Hi Peter, how can I find the whole class sheet of Blogger's CSS. I was wondering, I know it's easy to figure out that the class for Post Title is 'post-title' and other developer somehow used the naming convention postTitle. Did you just figure it out by instinct or you know the whole class sheet? Can you teach me to find it please. sir where is the design tab ?? How many tabs do you see and what are they? cannot change the font COLOR of the post title. I have been searching everywhere for an answer. Thanks a bunch! This really helped me. Although,shortly after,I realized that my ''Followers'' title turned the ugly default colour. Any ideas how to turn that back to black? I am having the same problem as Asia-Pacific Guides and LifeinCreation.... how do you change the post title color, not just the background color?? Asia-Pacific Guides, LifeinCreation and Fancy Frills Style Studio, what templates are you using. Also, go to the template editor, press ctrl+F and search for post.title and let me know if you can find it. Hello. I have asked this twice and got no response both times so I will ask yet again. How do you do this for the sidebar titles! In Template Designer! My Advanced tool doesn't worked . how can I change my background ? and select your font type and color there. Sahid, welcome. Hope you find the info and tips here useful. Hi, thanks for posting this. It works for me! But, I wanted to put borders on my post title too for my "my journey to being a mom" blog, how to do that? Thank you in advance. However nothing happened. Can you help me on what will be the right code? Wow, after reading all this, I am really confused. I am using the "simple" template and under advanced settings for post title, I can change font and size but there are no color options. Can you tell me how to do this? I'm trying to change the Post title colour. I'm using "Simple" template too. Also using "Template Design". There is no colour picker in Advanced. So, I tried adding CSS code from a link to blogger, doesn't work. Any suggestions please? Because your post title is a hyperlink, the only way to change the color of the font after adding the css for the background color is by changing your Link colors through Template Designer/Links. Sure you can. See, I did a test post at Testing image post title successfully to confirm.